Is Lost Auramancers put directly into graveyard with Solemnity in play? Does rule 112.6h break Genesis Hydra? Does Solemnity stop Force Bubble from preventing damage? Solemnity does not stop Mairsil's ability. 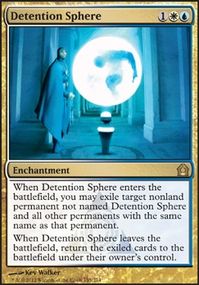 As exiled cards are not permanents, so are not creatures or artifacts. This is spelled out on the gatherer page for solemnity: "Counters can be put on cards that aren't on the battlefield"
Thanks fellas! !, I'm gona try Solemnity , Phyrexian Revoker , Sorcerous Spyglass and Sudden Death out and see if that helps. 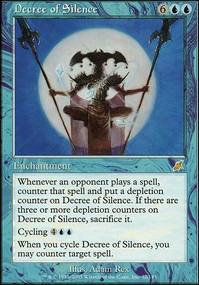 Solemnity has a very wide effect and is multipurpose so that your deck wont have such a dead card when not facing the mairsil. While you can use Persist and +1/+1 counters to create an infinite combo, you will not be able to do so with Mikaeus, the Unhallowed . To start, per Rule 121.3: If a permanent has both a +1/+1 counter and a -1/-1 counter on it, N +1/+1 and N -1/-1 counters are removed from it as a state-based action, where N is the smaller of the number of +1/+1 and -1/-1 counters on it. This means that if you have a creature with persist enter the battlefield and give it a +1/+1 counter, the +1/+1 counter and the -1/-1 counter from persist will cancel one another out. Since there is no longer a -1/-1 counter on it, assist will trigger the next time that creature dies. Likewise, if you used Undying and gave a creature a -1/-1 counter to cancel out the +1/+1 counter from undying, the creature would be able to benefit from undying the next time it died. Here's the problems with Mikaeus, the Unhallowed . First, that it gives creatures +1/+1 is irrelevant. This is a static boost to the creature's power, not placing a +1/+1 counter on the creature. Only +1/+1 counters cancel out -1/-1 counters; static boosts do not. So, while your creature's net change is +0/+0, it still has a -1/-1 counter on it, so persist would not be implicated the next time the creature died. The second issue is that you can't benefit from both undying and persist. Both abilities will trigger when the creature dies. You will have to order them so that one resolves first, and the other second. The first will resolve and place the creature on the battlefield. As the creature is already on the battlefield, the second will have no effect. 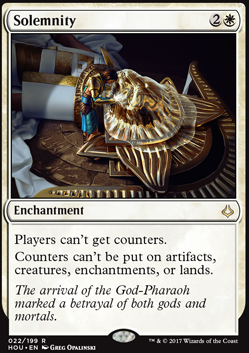 As such, you are either getting the creature with a +1/+1 counter if undying resolved first, or with a -1/-1 counter if persist resolved first; you will not get both counters on the creature, and thus will not cancel out either counter. 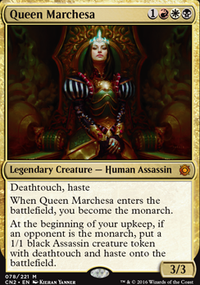 If you want infinite persist to work, you need to use something like Cathars' Crusade , which will place a +1/+1 counter on the creature to cancel out t he -1/-1 counter, or something like Melira, Sylvok Outcast or Solemnity to prevent the -1/-1 counter from being put onto the creature. Furystoke Giant looks pretty cool. Because it has Persist, you could just swing with it and hope opponents foolishly kill it. Then it will bounce back and you'll get the effect a second time. 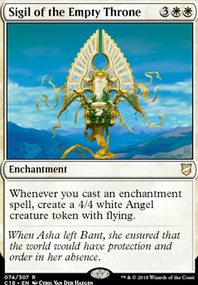 Since you're running white already, you'd have the option of including Solemnity , which would make the Giant very hard to get rid off, though that might be pushing the 60 card target of the deck a little far. Also, if you added red, you'd gain access to Lightning Bolt , which you could us to kill your Giant and thus bounce it back to the battlefield. Also, don't forget that Priest of Forgotten Gods deals 2 damage to each opponent every time you activate it. IMHO, I'd consider that a worth losing 2x 1/1 tokens. Not saying that's the direction you should go, just that it's worth considering.